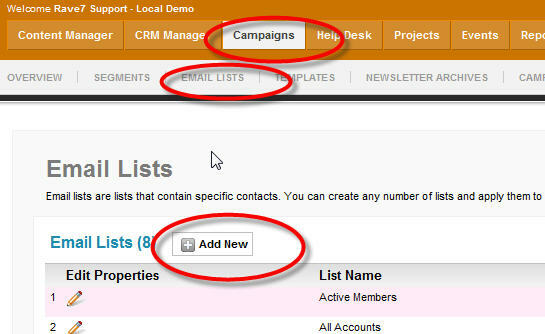 Using the Email Campaigns module you can create email lists to send email broadcasts to your customers. Email lists can include segments so that you don't have to manually add contacts to the list, or you can add users to the list if you want. On the following form, enter the details of the list and click the "Submit" button to create the list. If you want the list to be comprised of a segment(s), select the desired segments using the check box beside the segment's name. Best practices requires that your users subscribe to your newsletters using a double opt-in methodology. This means, when a user comes to your site and fills out a newsletter join form, that form will first email the users a confirmation message. Once the user clicks the link in that message, then and only then will they be subscribed to the list. This prevents robots or other users from signing up other people to your lists, and greatly decreases the chance that your users will report your emails as spam..
After you create an email list, edit the page in the CMS that you want to add the signup form to.